The babblevoice console is centred around 5 sections which are used for controlling the various functions. On this page, we offer a brief introduction to each section and what can be achieved with each one. 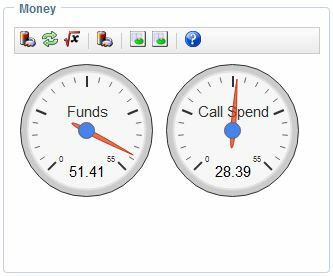 The Money widget is where you control the funds in your babblevoice system. With this widget you can add credit as a one off payment, via Paypal, or set up a Direct Debit to top up the account at the start of each month. Invoicing and all financial functions can be found here. The call spend, which is the amount of money spent to date this month of phone calls. Using this tool, you can work out roughly how much a call will cost. All you need is the destination phone number and how long you intend to call them for; babblevoice does the rest for you! View Invoices: This button allows you to see invoices for your calls. You can also go back up to 6 months, just in case you need to double check something. You can export up to 1000 calls at a time in one CSV file. The Rules section(s) are responsible for how calls are handled. They can be public (i.e. your phone number or a babble hash tag rule - public to all babblevoice users). The names are self explanatory, but the functionality that exists beneath Add a new rule and Edit rule can take a bit of time to get used to. For more detailed help, please go to the Call Rules help page. The right 2 buttons are for searching through your call rules using your phone numbers (very useful if you have quite a few numbers), and for making the Call Rules widget bigger (very useful if you have quite a few or lengthy rules). Perhaps we should have called this the Phone section. For most users it is about configuring a phone to use on your phone system. We called it Devices, however, as you can configure another VOIP server you may have on site to connect with babblevoice. So it is a slightly more generic term for that reason. But, you are more than likley to know it as the ‘Phones’ section. In this section you can add/remove/edit a phones config. Configure specific settings for a Polycom phone, auto provision a Cisco phone. Zero touch provision a Yealink or Polycom phone. We have also included a chart which shows the call quality of that phone. Which will give you an idea of ‘is your Internet good enough’? The users section is where you control the users accounts that have access of this domain. If you want to, you can add new users by using the Invite User button. This will send a link to the email address you specify with a link back to your account. The user will then be able to change rule, see/add credit, make devices. Actually, it’s pretty much anything you have access to. Bar one thing. The next button along is Delete User, and as you can imagine, it deletes users. The next one along is the “Bar one thing” I mentioned a second ago. This is a button that makes another user the primary user. Whoever the primary user is has complete power over the domain, and cannot be removed, but he who is primary, hath power to remove others. Certain items you can edit, such as phone numbers or call recording. Just click on the Edit Item button and find out.